This advanced search engine can be used to get a list of all cards in the Platinum Series Baseball game. However, this web page is more than just a Platinum Series Baseball card list. 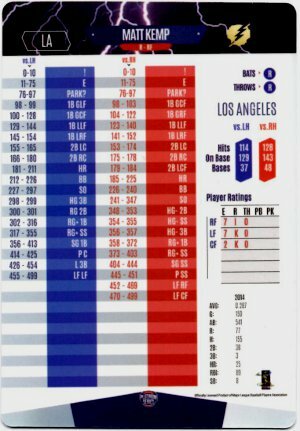 Each Platinum Series Baseball player card contains a ton of information some of which is directly related to game play and some is to inform you about a player's actual on field performance. 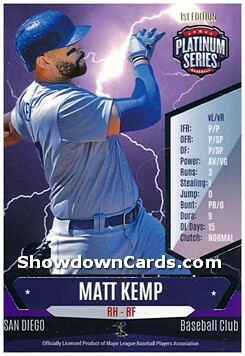 MLB Showdown cards have a simpler rating system with On-Base, Field Rating and roll results chart making up the player card ratings. All of this information is visible on one side of the card. In contrast, PSB cards have many more numbers and the back of the PSB card is packed full of numerical information. This advanced search feature is meant to provide information most relevant to game play. This means the historical information on the back of each card is not part of advanced search. The historical information drives the player card ratings used in game play but is not directly applicable and therefore is left out. In addition, only a few numbers from the front of each card are included because most of these numbers are for advanced game play. Below are the three main search forms that you can use to find a particular player or a group of players with particular attributes. Further down on this page, below the search forms, you will see the search criteria explained. The three main blocks of information are included on the back of the card. The defensive stats (also known as Player Ratings), roll results and in the bottom right are the MLB historical statistics from the previous season. As mentioned before, the historical info is not included in this advanced search. These 6 numbers are related to a batters offensive performance and can provide a easy way to judge a player's skill. High numbers are good for batters and low numbers are good for pitchers. Therefore the search results results should be sorted accordingly. The primary position for a player is displayed below the player's name on the front of the card. For example RH-RF means the player is right handed and plays Right Field. On the back of the card under "Player Ratings" all of the positions a player is eligible to play are listed along with ratings. There are five ratings for defensive stats. E - Error: This is a measure of the player's likelihood of committing an error. High numbers are better meaning they have fewer errors. R - Range: Is a measure of field mobility and how well the player handles difficult balls. The better the range the better the player is at covering his position. A letter is assigned for Range and the best score is A followed by B, C, D, etc. TH - Throwing arm: A good throwing arm reduces a runner's chances of reaching base safely. Throwing Arm scores range from positive to negative numbers and the lower the number the better. PB - Passball: A passball is when a ball gets by a catcher and therefore a Passball rating only applies to catchers. This rating is ranked from better to worse as Excellent, Very Good, Average, Fair and Poor. Location refers to the geographical location of the team. Platinum Series Baseball is officially licensed by the MLB players association. However, the game is not licensed by MLB therefore you will notice the player cards are missing team logos and team names. MLB has an exclusive licensing deal with Topps that runs through 2020. This is why you will only see MLB team logo and names on Topps cards and not on cards from other baseball trading card companies like Upper Deck and Panini. The Icon dropdown box refers to any special icons placed on the cards. Right now there is only one icon. A lightning icon in the upper right corner is visible on the back of some cards. These are player of the month cards, abbreviated as POM in the search results and throughout showdowncards.com. A purplish background with lightning is seen on the front of these cards. Each player has a regular 1st Edition card in addition to the Player of the Month card. These special cards are also referred to power cards or lightning cards. There are over 20 of these lightning power cards. The player of the month card stats reflect the best month the player had in an entire season. This inflates the card ratings and makes these cards some of the best for game play. There is currently only one edition and that is 1st Edition. We hope more editions for the game will be coming soon and these will be added under the Edition dropdown box.